After releasing his stunning debut "Diamond Days" on Traum and the follow up "Nothingness EP" Egokind told us he had the idea for an album already sitting in the back of his head. To be able to convert all of his ideas he asked his long time friend and collaborator Ozean to work with him. For both of them "Transition" is their debut album, but both artists can draw on a lot of experience recording music from multiple genres. The A1 track "Mega" is a track which illustrates Egokind & Ozean’s approach to touch many grounds resulting in something gigantic. The track itself begins rather acoustic inviting you to the private world of Egokind & Ozean, before it becomes a joyous balearic tune that despite its wealth keeps slight dissonances coming and going. "Every Time You Smile" is an energetic piece of warped music which swells and and then in the next moment is diminished to small islands of voices that turn like mad creating a new cosmos almost comical at times, but always very kind and gentle as well. On the flipside "Light Realms" flows into "Silverbird" with no pause: "Silverbird" then opens the curtain and lets the sun fill out the whole room with yellow golden rays. 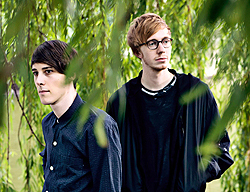 Egokind & Ozean then unfold a garage house track which makes small turns but stay very organic and warm. And "Everybody Dance Now" by its title makes things very clear. 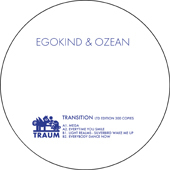 Egokind & Ozean have crammed all their skills here into an hi-energy dance track, still keeping one big surprise to come halftime, when they decide to leave the trail of club culture by introducing a fantastic acoustic intermezzo, juggling and bending their sounds to the max.